Shawn McClain, Chef and Managing Partner of FIVE50 Pizza Bar at ARIA Resort & Casino, has a knack for balancing innovative concepts with refinement and sensibility. At FIVE50 Pizza Bar, he has done just that by creating a casual yet distinguished dining concept. A native of San Diego, Calif., and a 1990 graduate of the School of Culinary Arts at Kendall College in Evanston, Ill., McClain’s star rose quickly in the culinary world. He broke onto the national scene at Trio restaurant in Evanston, earning four stars from both the Chicago Tribune and Chicago Sun-Times. There, his style came into focus, one that juxtaposes Eastern influence with Western foundations. After seven accolade-filled years, he left to open Spring – his homage to seafood. The restaurant opened in 2001 to extraordinary critical acclaim and consumer success. That same year, Spring was nominated for the James Beard Foundation’s Best New Restaurant award, and McClain was named Esquire magazine’s Chef of the Year. In 2002, he appeared in “40 Under 40,” Crain’s Chicago Business’ highly competitive list of who’s who in the city. By 2004, McClain was ready to take on a new challenge and opened his second restaurant, Green Zebra. An immediate success, this vanguard concept brought vegetables to the center of the plate and was lauded by The New York Times, Bon Appétit, Food & Wine and several other prestigious publications. Green Zebra emphasized Chef McClain’s insistence on the quality of ingredients and his talent for creating innovative menus. In 2005, he swung the pendulum in the opposite direction and opened Custom House. Located in an historic, boutique hotel setting in Chicago’s Printer’s Row, this modern interpretation of the classic steakhouse focuses on artisan meats and classic sides reinterpreted with McClain’s unique flair. Custom House opened to rave reviews, receiving three stars from both the Chicago Tribune and the Chicago Sun-Times. 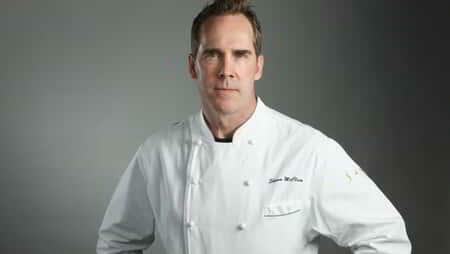 In 2006, McClain was honored with the Best Chef Midwest award from the James Beard Foundation. At Sage, McClain changed focus once more with a New American menu built around the irresistible freshness of California’s local harvests. When asked why he chose to open a restaurant in Las Vegas, McClain said, “I’ve been so fortunate to have achieved many of my goals in Chicago, an amazing city and great restaurant town. I have always aimed high, seeking new challenges. ARIA is such an awe-inspiring resort and I am thrilled to be among the chefs and restaurateurs here.” Continuing to challenge himself, in 2012 McClain put his skills to the ultimate test when he appeared on Food Network’s Iron Chef America and competed against Chef Marc Forgione. The epic battle resulted in a win for Chef McClain. Following the success of Sage, McClain opened his first casual concept, FIVE50 Pizza Bar, also at ARIA Resort & Casino. Here, McClain put his own spin on East Coast-style pizzas, using only the freshest seasonal ingredients and hand-selected 11 American microbrews to fill the restaurant’s taps. McClain’s dynamic culinary expertise is exemplified with the diversity of FIVE50’s menu which elevates the casual dining experience.